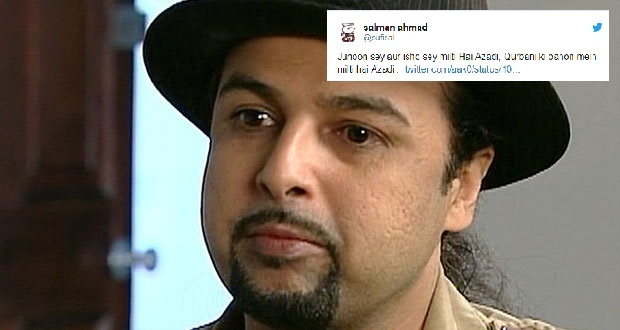 Former Junoon bassist Salman Ahmed on Saturday came under serious criticism for his “insensitive” tweet on the Mastung attack. On Friday, at least 131 people, including Balochistan Awami Party’s (BAP) candidate Siraj Raisani, were martyred and 200 others were injured after a suicide bomber targeted a public gathering of the party. Musician Salman Ahmed on Saturday took to Twitter and shared the lyrics of “Junoon Se” – a widely popular song – associating the lives lost in Mastung with sacrificed lives in the hopes of freedom. Soon after Salman termed the deaths of Pakistanis a “qurbani” while seeking “azaadi”, he landed himself in hot water as hundreds of people from different walks of life stepped forward to offer condolences and censure the Pakistan Tehreek-e-Insaf (PTI) buff. Salman bhai aap apni jaan qurban kar dein mulk k liye i promise i will vote pti. You didn’t just say that. This was a terrorist attack by junooni terrorists. Don’t equate killing of innocents with qurbani. Stupid Ppl like you have destroyed #ImranKhan thinking capacity to below average. The artist then went on to justify his earlier statement as well by sharing a clip from the film “Jinnah”. In a later tweet, he also aspired to reach the level of martyrdom himself.